So the economy is on its own again as the Bank of England ends its second round of stimulus. Having said that, the Bank is clearly leaving the door open for a third round of QE if required. This seems likely to come sooner rather than later, as the UK economy is languishing in a recession and struggling with ever rising inflation. However, the main cause for concern at the BoE is that the easing itself is causing inflation to overshoot their target. Inflation is still a problem for the UK economy as it has not fallen as much as the Bank had been expecting. It continues to remain stubbornly higher than in other Western economies and so the BoE faces a nasty juxtaposition. Whilst the decision was widely expected, it gives an indication that the priority for the central bank is edging back towards inflation rather than growth. This is a slight shift as the Bank had been focussing on growth, despite the fact that their remit is to keep inflation under control. This is an opportunity for policy makers to reflect on the stimulus of the past to see just what good it has done for the economy. The Bank's own claims are that the first round directly helped GDP, but they'll struggle to claim that this time round. The economy hasn't been helped by either the global picture or the coalition's inept tax and spending plans, but the QE program is questionable as well. There have been some signs of confidence returning to the UK, as seen in the business surveys over the past six months or so. However, that confidence hasn't turned into real investment and growth yet because the banking system remains locked up. If you're going to print money then it should go directly into bringing real borrowing costs down for business and consumers who are the front line of the economy. This morning European spread betting and CFD trading markets are lower on the open, showing how fickle yesterday's rise was. Headlines are filled with the massive 'erroneous' trading losses at JP Morgan which certainly knocked Asian markets a bit. This is also affecting the UK 100 this morning, with the index currently around 20 points lower at 5520. Once again this brings into question the corporate governance of a bank and highlights further failures within a sector that is never going to be immune to such events. Just when US banks had been nursing themselves back to health, one of the biggest ones joins the ever growing list that have suffered massive trading errors. Yesterday, the Wall Street index joined a global rally, recovering 23.46 points to 12,831.58 on the back of a fall in US jobless claims. It was a sigh of relief that alleviated some of the worries surrounding the US employment sector. In addition, Fed Chairman Ben Bernanke acknowledged the challenges for the US banking system but said the banks are 'more resilient'. That was until the news from JP Morgan came along. The Eurozone worries continue and now Spain is propping up its banking sector by injecting cash into its fourth largest bank, Bankia. It's a reminder that the Spanish property market is in serious trouble. This follows the boom years when developers were clambering to get a piece of the action, building huge numbers of flats and villas with borrowed money. Now that no one is around to buy these properties, and banks are no longer willing to lend to bargain hunters, the property market has completely collapsed. The problem with Bankia is that it is one of the most heavily exposed to the Spanish property market. They have distressed property assets to the tune of some €32bn. Such an intervention by the Spanish government had widely been expected for some time now. However, the overriding fear amongst investors is that the country is slowly going down the route that Ireland took. In Ireland, the state made its own banking sector interventions just before the country needed its first bailout. If Spain goes down the same route, then the focus will move to Italy, the most indebted beast within the Eurozone, and this will really spell trouble. In the UK, we might think that British taxpayers are hard up for having to take the brunt of our banking sector's mistakes. However, this is fairly trivial when compared with the problems that some of Europe's other taxpayers have had to endure. Amid growing concern regarding the political turmoil in Greece, and the failure to put together a coalition government, the Dow Jones extended its losses for a sixth session in a row. The index dropped to an intraday low of 12,748, getting closer to the support at 12,710 from 10 April. However, the Dow did manage to rebound towards the close, only finishing lower by 85 points at 12,835. This semi rally from the lows has meant that the European indices have opened slightly higher. At the time of writing, the FTSE 100 is at 5540, some 15 points in the black. Today's highlight comes in the form of the BoE interest rate decision but the question is whether the Bank will continue with further QE. Current investor consensus suggests that they won't. However, with the UK economy back in an official recession, there is a chance that they might pump a little more into the market. The problem is that the Bank is unsure of exactly how much its current QE program is contributing to inflation. And with inflation remaining well above target, they can't go too mad with their money printing machine. At the very least crude oil futures have declined from their highs over the last few days. Hopefully we might soon see this translate into lower prices at the pump. The anti-austerity rhetoric coming from France and Greece hasn't been good for the markets in the last few days. Yesterday saw the FTSE 100's 2012 gains wiped-out. There's nothing wrong with calling for more growth measures but it has to be in the context of existing fiscal capabilities. Without some sort of prudence, government spending and debt burdens will continue to spiral and be even more difficult to address further down the line. In the case of France, the share of government spending in terms of GDP, is amongst the biggest of the Western economies. Increasing government spending will not be looked upon favourably by financial markets. In the end, the new French President scraped into office with his message of change. He wants to renegotiate the most recent European fiscal pact, increase the minimum wage, reduce the retirement age (which Sarkozy had fought so hard to increase) and increase taxes on the rich. Many of these measures were designed to do what all politicians want, i.e. gain power. It will be interesting to see if Hollande's bite is as big as his bark. His bark could get a little quieter if the political fallout in Greece continues and ends in yet another default and ultimately a Greek exit from the Eurozone. The losses for the French banks would be considerable. The French CAC 40 dropped 2.8% yesterday, one of the worst performances amongst the European indices. If the French government had to bailout one of their banks then this would cause serious ramifications for their fiscal situation. If so, Monsieur Hollande's bark really would turn into a whimper. Equities were sold off on both sides of the Atlantic yesterday. This was primarily down to the political uncertainty in Greece rather than France. 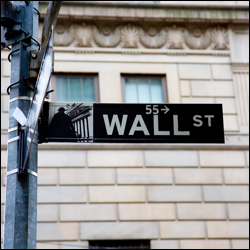 Whilst the Dow Jones dipped below the 13000 level, it did manage to rally from its lows. This morning European indices were expected to open in the black but at the time of writing, few buyers have emerged and so we are roughly flat at 5555. Traders should avoid extrapolating what politicians are actually going to do in office from what they said during the election campaign. Monsieur Hollande is very unlikely to implement some of the more aggressive statements in his manifesto. Taxing those earning above €1m at a rate of 75% would impact tax revenue and employment numbers very negatively. People should be aware that the bulk of big earners are not in financial services. They are in the vast array of private companies that proliferate across the European landscape. Taxing the earnings of such people would drive investment out of France and into more accommodative countries across the globe. The basic question is why would anyone invest, work or risk capital in a country where the state will take most of your earnings? A financial transaction tax would almost immediately drive such business overseas. It's not as though the UK or Germany are a million miles away. Whilst some people would say "so what, financial trading is 'socially useless'", the exodus would also mean moving trading capital overseas. This would certainly hurt broker/bank balance sheets. In addition, any attempt to implement some kind of Expansionary Austerity would certainly set stock markets on edge. Soft Austerity is just another way of saying "do nothing and hope something turns up". I am afraid that the woes of the Eurozone sovereign debt crisis are well beyond this. One of the major problems is that government expenditure seems to be a virtually un-slayable beast. Companies appear to be able to actually cut, or at least stop, expenditure in actuality rather than 'in real terms'. But a huge swathe of government outlay, benefits/pensions/capital expenditure, is fixed versus inflation or other factors. To impact outlay would mean actually cutting salaries and final pensions, even for those people who have already retired. Governments would also need to slay the dragon of health budgets and decide that perhaps Europe doesn't need to be directly involved in solving all the World's problems. That said, we all know that most politicians will make the easy choices until the choice is effectively taken away from them. Unfortunately, Hollande risks falling into this camp. Today sees a bit of a pull back in the spread betting and CFD trading markets and it is difficult to argue with this. In the current environment, the simplest route is probably the wisest. The major European indices are still up nicely on the year, so it is not cowardly for investors to pocket some return and await events. The stock markets had a bit of an exciting opening yesterday as the Far East reacted very negatively to the European Elections. Throughout the day some bargain hunting held sway, as investors pondered whether anything would really change, and so shares ended higher than their close on Friday. Today is seeing a reaction to this, with the DAX sitting just above the previous support of 6500/10, currently trading at 6524/25. Investors using technical analysis will be looking to see a test of this level in the near future. On the upside, bullish investors will be hoping to see 6570/75 and 6590/6600. The FTSE remains at the lower end of the years trading range, effectively 5550-5975, at 5635. There is little to really go for in either direction but our spread betting account holders are getting long in anticipation of a confirmation of the range. There is even some speculation about the possibility of a move back up towards 5800 and beyond. Only a close below 5550 might change this opinion. The indices have managed to hold up rather well this week, despite economic data coming in consistently worse than expected. Manufacturing, services and employment figures have all disappointed. This suggests that even if growth does exist, it is not likely to surprise to the upside. The headlines however have been dominated by politics, with local and mayoral elections in the UK and national elections in France and Greece. Across the water it looks like the race for President is closer than before, and it is certainly closer than the drubbing that the Coalition has suffered here. Even though the French election had been looking like an easy win for Hollande, the financial markets have remained fairly composed. There hasn't been any hint of nervousness since the initial worry that followed the first round of voting. The bond markets currently seem to feel that even if Hollande gets in, he won't be able to do all that he has proposed. Particularly since France has already lost its triple A credit rating. We will have to wait and see what Sunday and the following weeks bring if France elects its first socialist President for 17 years. The FTSE is in the red by some 20 points this morning, following weakness across the pond. All eyes will be on today's US Non Farm Payroll number, which has seen forecasts downgraded since Wednesday's weak ADP figure. Having said that, yesterday's initial jobless claims bucked the recent trend, by coming in slightly better than expected. The bulls will want to see a decent Non Farms number if the Dow Jones is to continue making fresh highs for the year. The big figure is due to come in at 170k. It is a little surprising to see the financial spread betting markets holding up so well this week. However, with trading remaining in a very narrow range, it would be nice to see some excitement return to the markets. Londoners go to the polls today and, across many parts of the country, local elections will also be taking place. The mayor's office is expected to remain the same colour, and I've even heard that some bookies have already paid out on Boris winning. However, swathes of red are likely to cover previously blue councils, as voters vent their frustrations following a terrible few weeks for the Tories. Political gaffs and a weak economy are the main reasons for the sudden and sharp mistrust that voters now seem to have for the Conservatives. The only real surprise is the sheer speed with which it has happened. Rather like a stock market crash, their popularity has completely fallen off a cliff. It wasn't all that long ago that the majority of the public seemed to agree with their economic plans. Interestingly, however, voters are still unwilling to give their backing to any of the alternatives, so it will be interesting to see just how far the discontent runs. The government has been consistent in using all the usual excuses at their disposal. They have spent their time blaming our stagnant recovery on the Eurozone crisis and slowing US and Chinese economies. Whilst these factors certainly don't help, and are partially to blame, fault also lies with the Coalition. They have been less than helpful in making the sort of changes required to boost our economy. We need a more flexible labour market and proper tax reduction to spur growth. Once again the FTSE failed at its recent highs and, just when it looked like it had managed a break higher, it reversed its gains. The last few weeks have seen the index stuck in a bit of a range between 5650 and 5800. This morning the FTSE is knocking on the door of 5800, having jumped on the open after the false breakout. The momentum since mid April has been in favour of the bulls, who still seem to have the upper hand. We can't discount a possible test of the 2012 highs in the near future, especially if US shares remain in their bullish mood. Having said that, near term resistance remains at 5800/20 and we're unlikely to overcome this level if we see more weak US data like yesterday's ADP number. As a result, the NFP will have to be rather good for UK spread betting investors to see a break to the upside. With many European markets closed for business yesterday, French and German shares are set for a boost in today's session. Strong manufacturing data from the US, the world's biggest economy, has given investors hope that the economic recovery is gathering momentum. The figure itself showed that US manufacturing grew in April at the strongest rate in 10 months. This resulted in the Wall Street index closing at its highest level in more than 4 years. Nevertheless, investors are likely to remain cautious after this morning's report showed that China's manufacturing sector shrank during April; the sixth consecutive month of declines. Tuesday's session saw strong gains on the back of the better than expected US data, which pulled global banks and commodity stocks higher. As a result, investors will be looking to see if the FTSE spread betting market can keep up the bull run after the index broke through the near term resistance around 5790/5800. So far this morning the London market is in negative territory, just above the 5800 level, after trading higher at the open. The test for the bulls will be whether they can turn the breached resistance area into support. Today sees the release of April UK Construction PMI data and the Bank of England March Consumer Credit and Mortgage Lending data, with both coming up at 09:30 BST. Considering the weaker than expected UK manufacturing number yesterday, it would not be a surprise if this morning's figures also look weak. Particularly since construction was one of the main factors behind the negative GDP figure last week. Across the pond, April's private payroll ADP figure is due out at 13:15 and will give market participants an idea of how Friday's Non Farm Payrolls might look. To top things off, March US factory orders and revised durable goods orders are scheduled for 15:00 London time. Sell in May and go away? Not yet it would seem, as yesterday's sell off was one day too early for us claim that this age-old adage is playing out. May is historically a mixed month for the UK 100, with half of the last eighteen years seeing gains and the other half seeing losses. In both cases the average move is just over 3%. Continental European indices are closed for their May bank holiday so volumes are likely to be thinner than normal. As a result, it is hard to see there being any significant move in either direction for the London market. Even though European woes continue, with Spain dipping back into recession and Greece seeing weak retail sales, the indices spread betting markets have held up pretty well. So far the bond markets are yet to really attack Spain as they have done in the past. And they have certainly not pushed Spanish yields higher in the same way that they did for Ireland, Greece and Portugal ahead of their bailouts. It seems a little odd that this is still the case, as the general consensus seems to be that Spain is teetering on a knife edge. The country is attempting to implement austerity measures that will do little to bring down their ridiculously high unemployment or spur growth. At a time when street protests are growing, the new recession will make the government's task of cutting the budget deficit even harder. To add to European concerns, most commentators seem to think that Greece will either need to have its debt restructured again or will ultimately leave the euro altogether. The UK 100 is just seeing a little interest from the bulls this morning as it attempts to recoup losses from yesterday and, at the time of writing, is trading at 5750. The index is still yet to get itself above what's proving to be strong resistance around 5800. If this break were to materialise then there could be a push higher to around the 5830/50 and 5900 levels. To the downside the major support is around 5640. Financial Spreads' clients seem to be fairly undecided as to where the UK 100 is headed in the near-term, as they are pretty much flat overall. Whilst the same can be said for the German DAX, US indices, which continue to defy gravity, are being heavily sold by our clients. They clearly believe that some sort of major retracement is around the corner as we are yet to see such a move. The spread betting and CFDs markets seem to be defying gravity at the moment as they brushed off Friday's weaker than expected US GDP figures. Stock market indices managed to post a half decent gain following a turbulent few days that saw many of the major macro issues return to the forefront. Spain's woes continued with unemployment hitting the 25% mark and a downgrade by S&P acting as a reminder that all is not well in the Eurozone. Over the weekend, protests against the government's austerity measures took place across the whole country. For now the protests have been peaceful but it's almost certain that there'll be more to come in the future. It will be very interesting to see whether they evolve into Greek style demonstrations. The last couple of years have served to show that austerity is not the only answer to the debt crisis. In fact, when it is imposed, it needs to be done hand-in-hand with growth stimulus. There's no denying that profligate government spending is in dire need of cutting back even further than most of the proposed plans. However, when it is being done at the same time as curtailing bank lending then economies are going to be suffocated. In the UK we've seen the evidence as our economy has dipped back into recession. Voters are now seriously out of love with the Tories who are footing the bill for all the recent political clangers. It's amazing how a few headlines about granny/pasty taxes and an inquiry into telephone hacking can turn large swathes of voters against you in such a short space of time. With more austerity still to come and further government spending cuts planned, it will be nearly impossible to win voters back. That is, of course, unless the government can actually do something meaningful to help businesses invest and grow, rather than tinkering around the edges. It wasn't all that long ago that the majority of people were in favour of the cuts, but now that's all changed. This morning the FTSE is hovering around recent highs, finding the resistance around the 5800 level a bit of a hurdle for now. Trading at 5778 at the time of writing, spread betting account holders are not currently rushing for the exit. Considering the market's recent strength, an attempt at breaching the resistance can't be ruled out.